Tools work separately or together to GENTLY LIFT ANY PRINT...large, small, delicate. 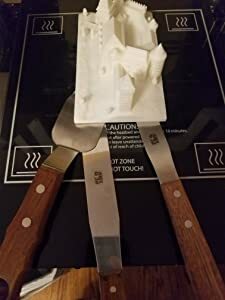 The AMX3d 3D Print Removal System solves all your 3D Print Removal problems with one comprehensive set of 3 tools designed specifically for 3D printing. Whether you print on a heated glass bed, aluminum or other metal bed; whether you prefer hairspray, glue or tape, whether you are removing large prints or small, intricate and/or delicate prints, this set of 3 tools makes the job easy - without damaging the print or the print bed. 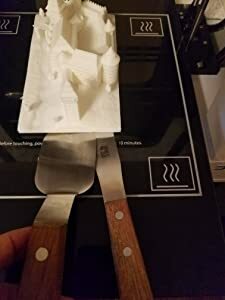 The problem with other 3D print removal tools is that they are either strong enough to lift a heavy print but too thick to slide under without nicking or marring the print edge or thin enough to slide under a print but bend and flex easily - often destroying the tool without removing the print. Our 3 tool 3D Print Removal System solves these problems once and for all. 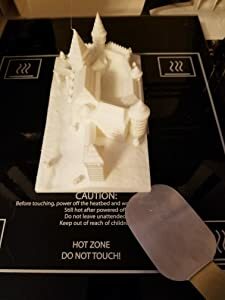 With these tools, you'll never pry the print off the print bed, instead, they are designed to work together to slide under even the largest prints and gently separate the print from the print bed... without damaging the print or the tools! The High Quality finished wood handles each have 2 strong pins holding the blade to the handle (vs. most that don't have pins at all so their handles pull off in the middle of the job). Put simply, the tools work and they last! Remember: The Best Prints Start with the Best Tools! NO DAMAGE to the print or the print bed. 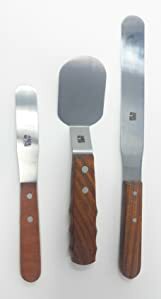 STRONG, DURABLE pinned tang construction - the wooden handles can't come off! First, our Ultra Thin Removal Tool. With a super thin 0.3mm edge, this flexible tool slips easily under the print The 17.5mm thick handle makes it comfortable to grip and the carved finger slots make it easy to exert the pressure required to break the initial seal between the print and the print bed. For small prints, this may be the only tool you need The Medium Removal Bar measures a little over 20 cm (8"), equally divided between handle and lifting blade. The 10 cm (4") lifting blade is a littlethicker (0.5 mm) but still flexible. 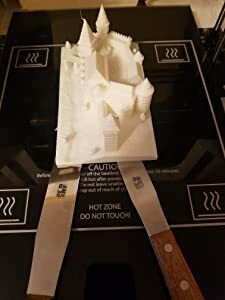 After the Ultra Thin Removal Tool has broken the seal in one corner of the print, this tool slides underneath it and under the print to break the remaining seal. The Large Removal Bar measures almost 30cm (12") with a 17 CM (6.75") lifting blade. This tool is even stronger with a 0.7mm thickness at the edge. It's large length ensures it can reach across almost any 3D print. This tool is extremely useful for those large and/or especially delicate prints. Using the Ultra Thin Removal Tool, slide the tool under the edge of the print. For small prints, this may be enough to remove the print from the bed. Remember... Don't pry, simply slide the tool under the print. If the print is still affixed to the Print Bed, gently slde the Medium Length Removal Bar under the Ultra Thin Removal Tool. The 10 cm (4") blade will go deeper under the print. Slide it under the print as far as you can easily go without damaging the print. Still gripping? Now we call in the "big guns". Leaving the Medium Length Removal Bar in place, slide the Ultra Thin Removal Tool across the edge of the print to the next corner/edge. 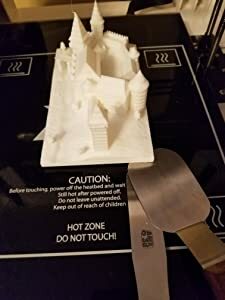 Remember - Don't pry - use the thinness of the blade to slide under the print. 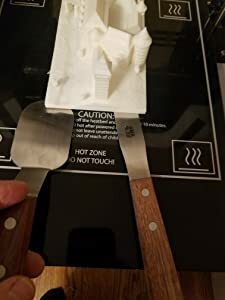 Sliding the Large Length Removal Bar under the Ultra Thin Removal Tool, slide it under the print to gently lift the 3D print from the print bed. Simply slide the tools together and push back until the print is released! Viola - Every print removed easily, without marring the print edges or damaging the print bed.